Sometimes you really can believe the hype. The audio company Edifier likes to tout its R1280T speaker model as “the best $100 speaker” on the market — which are strong words, considering everyone from Yamaha, to Sony, to Cerwin Vega are fighting and clawing for that low-to-middle end segment of the market. Despite the competition, though, the R1280T really is one of the best systems you can get at that price point. It stands up well against competitors that cost about twice as much, but that’s not to say it’s perfect. Edifier has been designing and selling audio gear for more than 20 years, including everything from high-end speaker systems, to headphones, and Bluetooth speakers, so there’s certainly a level of expertise there. It seems the company leveraged almost every bit of it when putting the R1280T together. First, the basics: The powered, dual speaker system includes dual RCA inputs to allow for multiple devices (a real coup for a system at this price), as well as a wireless remote that allows users to adjust the volume and mute the sound. It also features a four-inch bass driver, and a calibrated and flared bass reflex port. If you like to have some control over your audio, the R1280T delivers on that front, as well. The system includes bass and treble dials (along with the volume dial) on the active speaker, which provides a good bit of flexibility depending on what you’re listening to, and how you’d like it to sound. For a system that sets you back less than $100, it sounds like something worth a good bit more than that. Not like what you could get for a few hundred bucks, obviously, but at the top of the game in its price range. The bass is rich and punchy, the highs are lows are clear, and it pumps out more than enough crystal clear sound to rock out in your living room or office. I tested the speakers hooked up to a few different turntables, and it kept the tunes rolling. If you’re looking for a speaker set-up to build an entry-level or mid-tier audio system around, this one is pretty much the best option I’ve run across. The system isn’t huge, but it pipes out some volume for something so small. It’s obviously not what you need when it’s time to light up a house party, but it’ll do the trick for pretty much any of your household jams. If your space is limited, or you’re just looking for something small, save yourself some time and buy these speakers. The setup process is relatively painless — if you know how to plug a speaker into a stereo, you should be set. Even if you don’t, it’s plug and play enough to put together in just a few minutes. The RCA inputs provide a great connection (though the included cables are nothing to write home about), and it’s painless to tie in the passive speaker with some quality speaker wire once you have everything up and running. Pretty much everything you need is in the box. Well, you know, except for the stereo or turntable. You have to bring that yourself. The included directions are also easy to follow if you need a bit of help. As far as aesthetics are concerned, the R1280T is one of the best looking speakers sets you’ll find for the size and cost. It’s simple, elegant, and the woodgrain style mixed with a more industrial front goes with pretty much any setup. 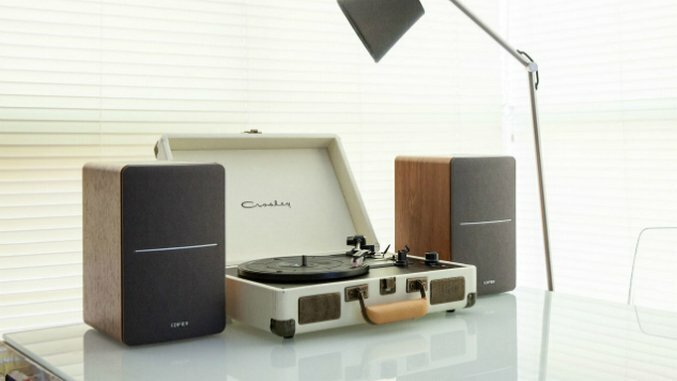 Have a sleek, metal-style record player or audio set-up? It’ll make it feel a bit warmer. If you have an earthier style, it’ll fit right in, too. If you’re setting it up on on a table beside your record player, or mounting it on speaker stands, it has enough heft and style to look good regardless of the layout. Even the dials and controls, contained in a recessed housing on the side, are stylish and have some heft to them, and thus don’t feel cheap. The system also has some tiny “feet” on the bottom to keep it from bouncing, which helps it stay put, preventing unwanted movement and possible scratches. The R1280T may be great, but it’s not perfect. It has a remote — which is great for a system this size! — but it underwhelms. It’s tiny, and can only be used for mute and volume adjustment. It’s frustrating to have a remote, but still be required to reach around the side of the speaker to actually turn it on. It’s not at all uncommon with systems of this size and price range, but still worth noting. There’s also the feel of the system itself. It’s not bad at all, but still comes across as a bit plastic-y in places. Again, it’s a solid system, but just worth noting. It’ll look fine for most, but if you’re particularly picky, you might have some gripes. The cables included in the box are also of so-so quality, so if you’re serious about your audio, you may want to snag a set of gold plated ones to use, instead. The included cables are certainly decent (and it’s a nice touch that they are included in the first place), but they’re not going to blow your socks off. Give up a wiggle and you might get a crackle or two. Which isn’t ideal. In case it wasn’t already obvious, this is a great set of speakers. If you’re not looking to spend a ton — or just have a smaller space you’re looking to fill — you can’t do much better than the R1280T.